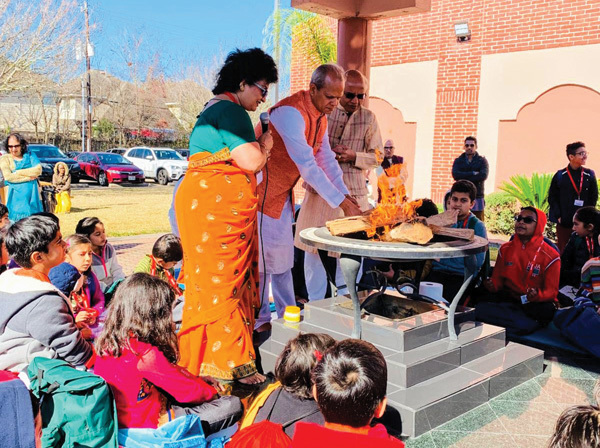 HOUSTON: This was third year that Arya Samaj Houston went full steam to celebrate the Indian festival variously called as Makar Sankranti, Lohri, Pongal, Bihu, etc. bidding good-bye to the peak of winter. Its Sunday School, the DAV Sanskriti School took the responsibility and converted it into a learning tool for its 150 children to grasp the rich Indian culture in an experiential manner. Acharya Harish-Chandra described God’s wonderful design that the earth is slant by about 22 degrees as it orbits around the sun. The peak of winter is now almost gone and the days will be getting longer. If you see sun in the morning from a window that opens to the east then you couldn’t have missed out noticing that the sun is now shifting northward, having touched its maximum southern point. This magic of 22 degrees slant creates various seasons that is so important for rainfall, snow deposits, crops, etc, crucial to life support on the earth. Indian classical scientists called Rishis taught harmony with nature. For them, nature manifests God’s intelligence flowing toward us as pure love. That harmony requires us to return the bounty of nature back to the nature with a deep sense of gratitude. Offering the bounty to the fire transports it in its minute form to all the living beings without any discrimination. The traditional fire was lit by the senior volunteer of Arya Samaj Houston, Shekhar Agrawal followed by the children of DAV Sanskriti School lining up to offer rewari, gajak, and other foodstuffs into the fire before having a taste of them. Their discipline was at full display. Traditional folk dances from different regions of India were rendered in the form of Garba, Bhangra and Pongal dance. Remarkable ensemble was noticed that dance teams included all age groups – from little children to even seniors. Six-week coaching by its dance teacher Dolly Goyal was well appreciated, founder of ‘Steps for Dancing’ – free for all, including members of public. As Chidanand’s dhol began the high octane sound, all in the 600+ adult audience felt invited to dance on the foyer that had become the large-size stage. Kites were available and children were thrilled to fly them. Kitchen committee served with smile the special meal that included makki di roti and sarson da saag. New parents showed interest in enrolling their children to the spring term of DAV Sanskriti School. For more details, call its director Dr. Kavita Vachaknavee at 832.874.3376.